The Dukes of Hamburg are an all-star Garage rock/R&B review from San Francisco who claim to be from Hamburg, Germany. They do high energy, extremely listenable danceable 60's standards, and have truly become cult favorites on the West Coast and in Europe, where they have toured frequently. Lead singer Russell Quan is a bona-fide garage rock legend, he co-founded The Mummies and is a current/former member of the Phantom Surfers, Bobbyteens, Count Backwurds and The Flakes, just to name a few. New guitarist Chris Imlay was a founding member of the Hi-Fives, who did 3 records for Lookout! 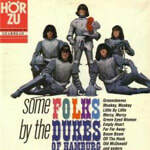 This is the first Dukes Of Hamburg recording released on compact disc, talk about retro!